As animal lovers, we love and cherish ALL our pets. But certain dogs (and cats) change us – they get under our skin, in our hearts, and our spirits are forever bound. Heart dogs enter our lives in unexpected and wonderful ways. Our time together is often brief, but the impact of our bond is mighty. They live on in our hearts and we see the world differently, more vividly and clearly because of the bond we shared. 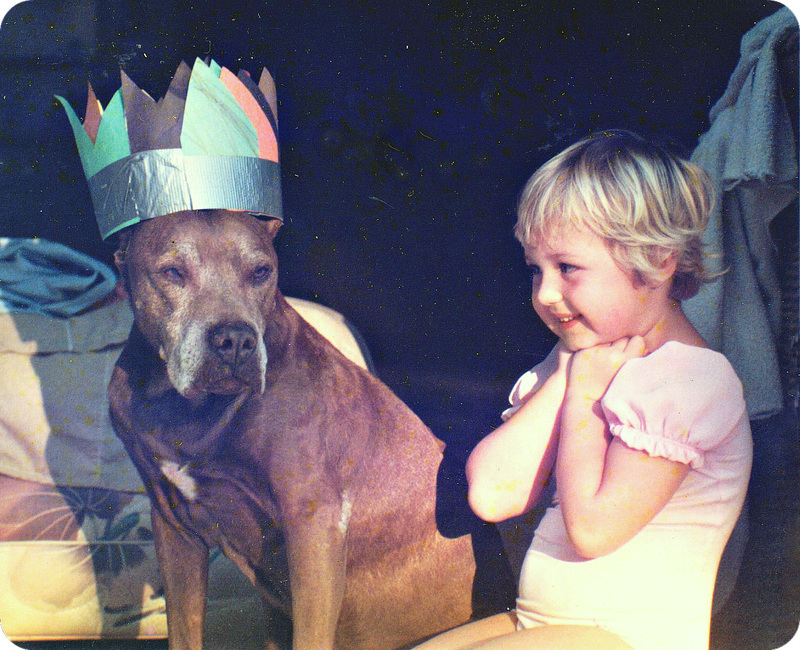 Rusty Boy was Pat and her daughter, Evi’s, heart dog. In 1992, Pat was driving her infant daughter, Evi, to daycare on a back road in rural Florida. She passed a large Pitbull, sitting like a statue alongside the road. He had a collar on so she kept going. She took the same route for the next two days, and on the third day, there he sat again. She pulled her truck over, approached him cautiously; he stared straight ahead and did not move. He had cropped ears and lots of scarring around his head and was wearing a collar, but no tags. It was clear someone had dumped him and he was waiting patiently for them to return. Pat carefully picked him up and placed him in the back of her truck. All the while, he sat perfectly still, staring straight ahead. Pat’s veterinarian estimated Rusty to be about ten. He was on the thin side, had a bad case of fleas and lots of old scarring around his face. From the start Rusty was elegant, proud, and gentle. Even when Pat fed him for the first time, when he was clearly starving, he ate slowly and didn’t gobble down his food. He was always first and foremost, a gentleman. Initially, Pat kept Rusty separated from her other dogs as well as Evi. He never showed any interest in the other dogs, but would quietly watch Evi from a far. One day Pat found him peacefully sitting next to her baby swing. From that moment on, they were inseparable and he became her everything. She learned to walk by holding onto his bony spine. When she was a bit older, they played dress up and other games together. Evi, now an adult, remembers that Rusty was always with her. She thought of him as a person and once told her mom that she could leave because Rusty would take care of her. Both Pat and Evi feel certain that Rusty was born, endured his painful early years, so that he could eventually find his version of heaven and have a child to cherish and raise. Rusty’s health began to fail when Evi was five. Pat struggled with when to let go; she did not want to put him down prematurely, but also did not want him to suffer. One of her friends hired a pet psychic to meet Rusty. She sat quietly with the now elderly dog and after a few minutes, asked who Evi was. The psychic said that Rusty was in pain, but was not ready to leave because he hadn’t finished raising Evi. Rusty Boy passed away a few months later after a spectacular, love-filled five years. Pat says he was not the dog to wax poetic about, more of an Atticus Finch with a simple, yet honest depth of character. Although their time together was brief, they loved him dearly and never missed an opportunity to let him know just how much. “Rusty had a huge heart and was truly my daughter’s guardian angel,” Pat remembers fondly. 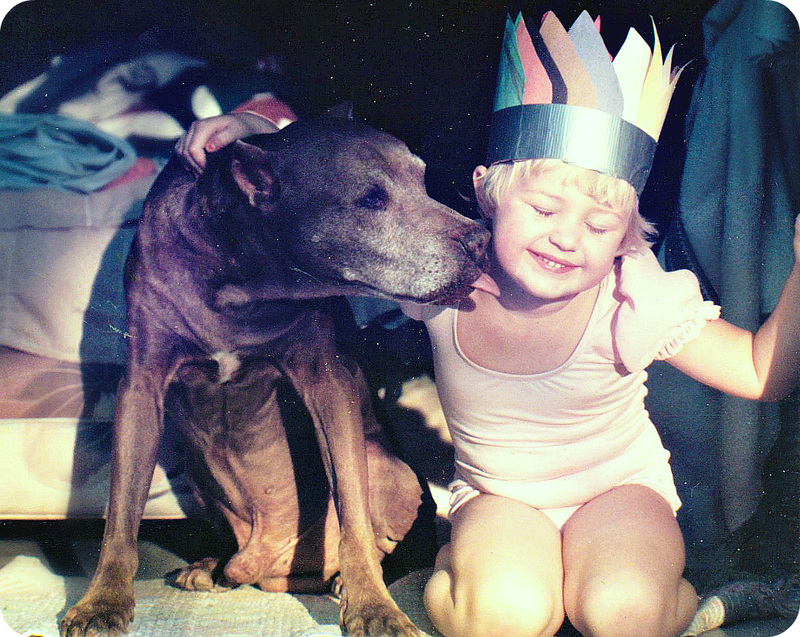 Pat says Rusty Boy forever changed the way she viewed Pitbulls and Pit-mixes. 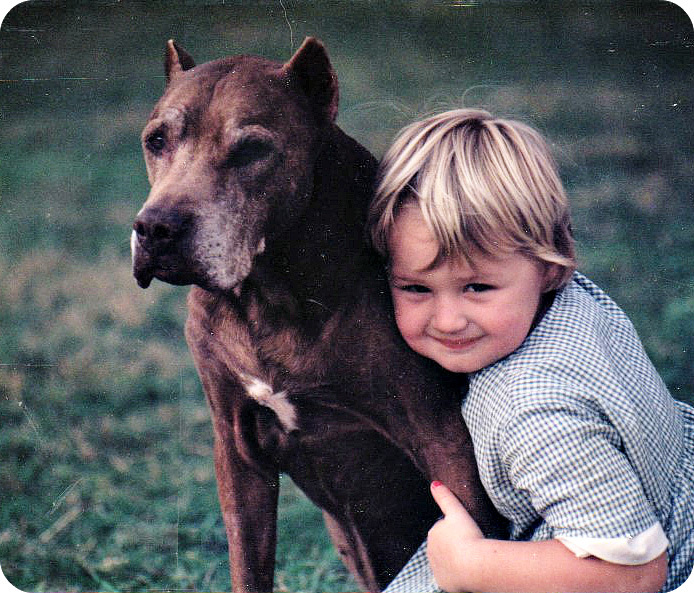 She has gone on to rescue many dogs over the years, including many pits, and even a few horses. Some never recover from past trauma, but they are safe and have food, water, and shelter. She loves all creatures and says the best reward of rescuing is that first moment of trust when an animal’s true nature begins to emerge. When not rescuing dogs, Pat runs Broad Meadow Farms, a highly successful and established horse training, boarding, and riding lessons facility in Ocala, FL. Thanks to Pat and Evi for sharing Rusty’s inspiring story. Thanks also to Elizabeth from The Chronicles of Cardigan for restoring these incredible, heartfelt photos. This is truly one of my favorite rescue stories as it so perfectly embodies everything I love about rescue work and the powerful, healing bond between second chance animals and the people who save them. Please do not adopt an animal if you are unable or unwilling to provide a lifetime of loving and compassionate care. If you are ready for adoption, please consider adopting or fostering a special needs dog because second chances are amazing whether you are on the giving or receiving side. Rusty is part of The Specials, an award-winning blog series focusing on special needs pet adoption. 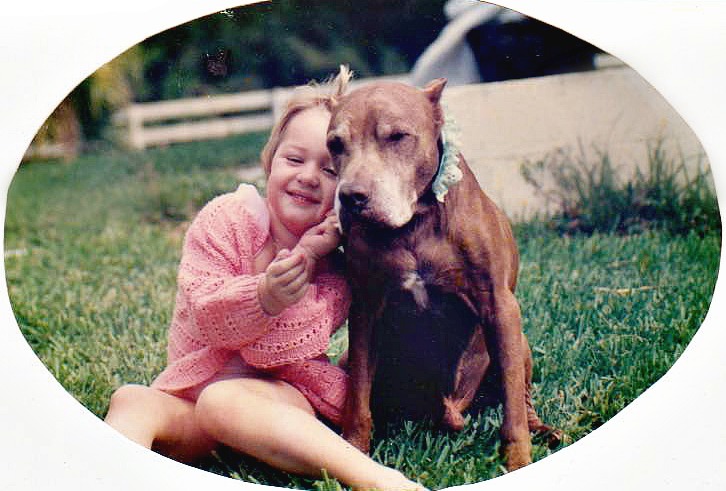 Senior pets, those with chronic medical issues, behavioral or temperament concerns as well as overlooked or misunderstood breeds like Pits and black cats. If not for the courage and compassion of their adopters, many of these animals might have been euthanized in shelters or died alone and hungry on the streets. You can read more special needs adoption posts here. This is such a special story. You can just see in the photos what a gentle soul Rusty was, and how deeply he and Evi loved each other. Thank you so much for sharing this beautiful story with us. Rusty was such a special boy. Thanks for sharing his life with us. That is such a wonderful story. So glad she picked him up and that Evi had the wonderful experience of a dog's love. I bet he was waiting for the people to pick him up. So sad, so glad that Pat found him. What a beautiful story. Thanks for sharing it. Those pictures sure show the devotion Evi and Rusty had for each other. Yes indeedy Ruby the flooring was loud but at least there were only 2 installers. Painting the entire interior of the house was worse cause there were 5 men all over the place. Beautiful story … about love and loss … and the amazing heart of a dog most would've overlooked. Tears. Another beautiful rescue story. I've never heard the term heart dog before, but I can certainly see why Rusty Boy was one. What a beautiful and touching rescue story. Thank you for sharing it. And thank you to Pat for saving him and for Evi for loving him. Those pictures are priceless, too. What a wonderful and heart touching story of true love!! Such a moving and heartfelt story. Thanks so much for sharing this. What a wonderful story! That stop by Pat changed Rusty's and Evi's life forever. Thanks for sharing another great special story with us. This was a special and wonderful story. Thank you for sharing it with us. Oh oh oh that is such a wonderful rescue story. How wrong we often are, to judge by appearances. What a special dog, and special people. So happy they found each other. Rusty certainly enriched their lives. A beautiful story. Thank you so much for sharing it. What a beautiful story and wonderful photos! Sounds like Rusty and Evi shared a wonderful bond. I have never met an animal psychic, but I think it would be interesting. What a special story…I sit here with tears and a smile. So much love to begin my day….the world needs more stories like this one…. Congratulations on your DWAA award nomination on this post! This is actually one of my favorites, it's a well deserved nomination.